For the working freelance sports photographer in Florida, New Year's Day can mean only one thing: Bowl Time! This year there are 5 major bowl games in the state including the Champs Sports Bowl in Orlando, the Outback Bowl in Tampa, the Gator Bowl in Jacksonville, the Capital One Bowl in Orlando and the Orange Bowl in Miami. For the ambitious freelancer with connections, these games provide opportunities on several fronts. First, its a chance to start the year off on the right foot, with a decent payday on the very first day of the year, there is also the opportunity to get good play in the media if you can capture good shots from these high profile, high energy events, you also get the chance to fill your files with photos of potential future NFL superstars (the above photo shows Ohio State running back Eddie George in action at the Citrus Bowl in Orlando in January 1995), and finally you get to see some good, fun college football firsthand, from the sidelines rather than planted on your couch in front of the TV. One of my favorite College bowl days stories comes from a photographer I know who lives nears Tampa. One year, as he tells it, he arose early New Year's Day and drove to the old Tampa Stadium to shoot the first quarter of the Hall of Fame Bowl. In a driving rain storm, the photographer jumped into his car and took off up I-4 to shoot a portion of the final quarter of Orlando's Citrus Bowl from an opening under the grandstands. Then it was back in the car, over to I-95 and north to Jacksonville where he worked that evening's Gator Bowl! For the Florida freelancer, New Year's Eve is often a night of moderate celebration and early bedtime followed by the first working day of the New Year. With the holidays upon us my thoughts today drift back to December 19, 1999. At that time in my life I had a 4-year-old daughter and a 2-year-old son and my wife and I were living in Daytona Beach, Florida and I was scrambling as fast as I could to make ends meet as a freelance photographer. That is how I found myself leaving my house at 6am on a Sunday morning to drive more than 200 miles to photograph a 1 o'clock Miami Dolphins/San Diego Charger NFL game at Joe Robbie Stadium. By leaving at 6 in the morning , I could make the drive to Miami and still arrive in time for the free, team-provided media lunch. At that time I was also covering some of the Space Shuttle launches at Kennedy Space Center in Titusville for Agence France Presse (AFP), the French wire service. I was going to miss this particular launch because of the conflicting football game that I was going to photograph. During the long drive south to Miami on that Sunday morning I had plenty of time to think and I , as was my habit, I began to calculate what time I would be home that evening. I wasn't long before I realized that, if the game ended at about 4 pm, as usual, and if I got to my car and on the road quickly, I would be near Kennedy Space Center by about 8 pm. I also knew that the Space Shuttle was scheduled to blast off at 9 pm. I picked up my cell phone and called my AFP contact at Kennedy Space Center and told him that, if he wanted, I could try to photograph the launch from somewhere nearby and then bring the film to him at the Space Center. He told me that would be fine and even better if I could somehow tie it in with the holidays, since Christmas was only a few days off. With my task defined, I continued south to Joe Robbie Stadium, where I shot the game, which the Dolphins won 12-9 (YAY! ), dashed to my car and headed north on I-95. As usual, between traffic, stopping for gas, grabbing some food, etc, by the time I was nearing the space center, I was running a little late. I was monitoring the launch on my radio , and knowing that I would have to drive 10 or 15 minutes east after leaving the interstate and still find a suitable site from which to photograph the launch, I made the decision to exit I-95 and drive east near Melbourne, FL at about 8:30. Arriving on state road A1A, which parallels the Atlantic Ocean with just a few minutes to spare I drove north, hoping to find some sort of Holiday scene. 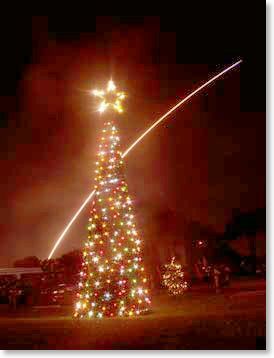 Sure enough, I found a decorated christmas tree at an oceanside park, parked my car, grabbed my camera and tripod and waited for the launch, which was now less than 10 minutes away. Although this before the days of readily available portable GPS, and while I didn't know exactly where on the horizon the shuttle would appear, I knew from experience that in a night launch a bright glow precedes the appearance of the firing column of the space shuttle rising into the night sky. With moments to spare, I mounted my camera on my tripod, set the shutter speed to "bulb", guessed at a f-stop, about f22 (these things are bright! ), and waited. The horizon began to glow, I placed my tripod appropriately and opened the shutter. The Shuttle streaked through the sky and was gone in less than a minute. I packed up and headed to the space center. This being before the days of digital photography, I processed my film and handed the frame to the AFP photo editor, who scanned in and transmitted in around the world. For my efforts on the day, between the football game and shuttle launch, a 500 mile drive and and a 16 hour day I earned about $500, including expenses. A successful day for a struggling freelancer in 1999! Shooting Race Cars in the Snow? 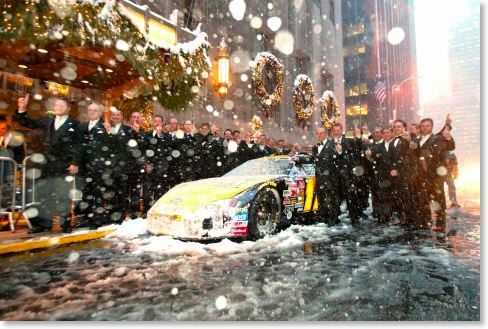 As I watched the Jacksonville Jags beat the Pittsburgh Steelers yesterday on a snowy, windy Pennsylvania afternoon,I thought of the winter afternoon in New York City a few years back where I stood on Park Avenue wearing a tuxedo in a blowing blizzard and photographed the newly crowned NASCAR Winston Cup champion as show shot horizontally through the photo. Matt Kenseth had clinched the '03 championship a few weeks before and I as prepared to travel to New York for the banquet from my home in Florida, I was excited by the weather channel's forecast of snow for the banquet week in New York, as I hadn't seen any real show since I was a 5-year-old growing up in Massachusetts. When the snow arrived, however, it was much more than I had bargained or prepared for, with 17 inches falling over the Thursday, Friday and Saturday of banquet week. The storm reached its peak late Friday afternoon and Matt Kenseth and his team prepared to pose with their race car on Park Avenue in front of the Waldorf. At the appointed time the driver, crew, and all the media (me included) walked out into the storm to record the traditional image of the NASCAR Champion and his crew and car in front of the Waldorf on Park Avenue. Wearing my light tuxedo in the blizzard, I might as well have been standing there in shorts and a tee shirt. I would bet that this Park Avenue Champion's shoot was the quickest, and most unusual on record. We quickly shot our photos and everyone dashed back into the warm lobby of the Waldorf. I've always liked the look of the photos from that shoot, with the snow blowing through the pictures, and yesterday, as I watched Jacksonville's Fred Taylor carry the football on a snowy field in Pittsburgh, I thoguth to myself that NFL players aren't the only ones who are called upon to perform their jobs in less that perfect weather. I guess it's only fitting that the first entry into my new blog features old race cars. After all I basically got involved in photography 30 years ago to be able to take decent pictures of one of the sports I love: auto racing. Obviously, that wasn't the only reason I first picked up a camera, it certainly figured heavily into it. For one thing, auto racing lends itself quite nicely to photography, with its bright colors, spectacular action and high emotions. I've photographed hundreds of motor races since 1977 including the Indy 500, Daytona 500 and Rolex 24 Hours of Daytona, so when "Rennsport Reunion III" rolled into Daytona International Speedway this past weekend and I was offered a n assignment to work the event, which featured hundreds of historic Porsche race cars and drivers, I jumped at it. I'd actually photographed many of these machines in the past when they were "racing in anger" as the saying goes, so it brought back many memories. The photo I've included in this post features the yellow #48 Porsche 917 driven by Jim Torres doing battle with the tiny #4 Porsche 908 of Phil Daigrepont in the Group 4 race on Sunday afternoon. I was struck by the tremendous difference in the size of the two cars as they raced side-by-side around Daytona's famous race course. The color and history of an event like this recommends it highly to any photographer looking to fill his portfolio with images of these rolling works of art.